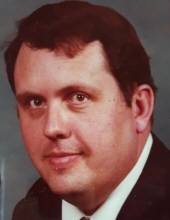 George Ward Cottrell, 73, widower of Linda Moore Cottrell, passed away Sunday, March 24, 2019 in Cynthiana, Kentucky. George was born in Minorsville, Kentucky on September 30, 1945 to the late George Cleveland and Emma Juett Cottrell. George was a member of Church of Christ, and was a graduate of Fugazzi Business College. He retired from Kentucky Revenue Cabinet as a tax auditor. George is survived by son, Chris (Pam) Cottrell of Cynthiana, Kentucky, grandchildren, Alex Cottrell, step-grandchildren, Chad Dawson and Kayla Dawson, and great grandchildren, Landon Dawson, Rylee Dawson, and Xaiver Samson. He was preceded in death by brothers, John Austin Cottrell and May Cottrell, and sister, Vera Cottrell. Visitation for George will be Wednesday, March 27, 2019 from 5:00-8:00 pm at Tucker, Yocum, & Wilson Funeral Home. Funeral services will be held at 11:00am, Thursday, March 28, 2019 with Rev. Glenn Redmon officiating. Burial will follow in Georgetown Cemetery. Serving as pallbearers will be Fred Cook, Jon Cook, Dewayne White, Tommy McKenney, Rusty Whitaker, Robert Fulton, and John Moore. To send flowers or a remembrance gift to the family of George Ward Cottrell, please visit our Tribute Store. "Email Address" would like to share the life celebration of George Ward Cottrell. Click on the "link" to go to share a favorite memory or leave a condolence message for the family.